The Kentucky Warbler was about 20 feet from us, eye level, in perfect light. He had to have known that we were watching him, but he appeared unconcerned about our presence and sat there singing. Birding does not get any better than this. It was one of those magic moments that Diane and I both treasure. We were alone on a forest service road in Ohio’s Shawnee State Forest and it was quiet except for the birds. This spot was perfect breeding habitat for Kentucky Warblers – low ground with lots of brushy cover by a little creek. 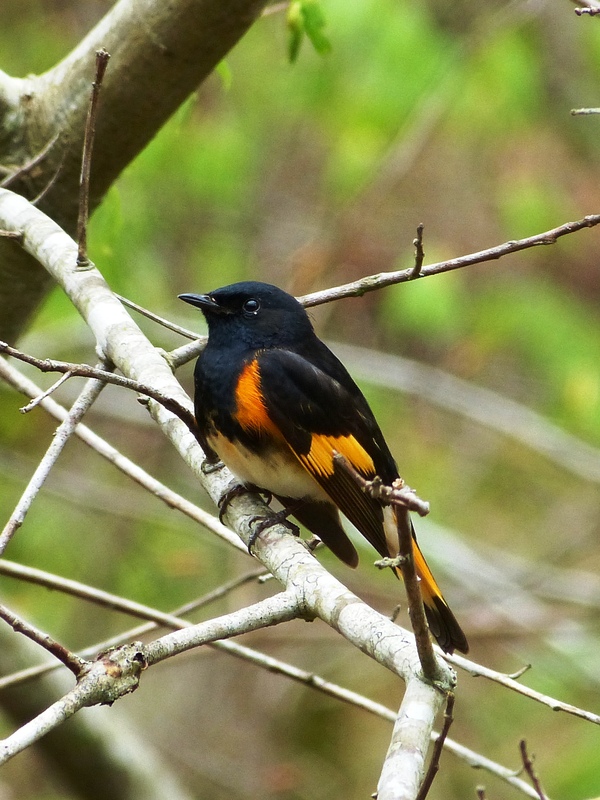 I was too lost in the moment watching the Kentucky Warbler to even try for a photo, but I was able to get this shot of an American Redstart the previous day. Diane and her husband planned to visit their daughter in Indianapolis and Diane wanted to meet for a few days of birding. We decided on Shawnee State Forest and I was pleased that Diane liked it as much as I had on my first trip. We arrived on Monday afternoon, April 28, and were able to bird for a couple of hours in relatively dry weather before dinner. Unfortunately, we had awful weather for the rest of the trip. The next day it rained until noon and was uncomfortably hot all afternoon after the sun came out. The following day it rained non-stop. And, then it was time to leave. But, still, we found quite a few birds including Hooded, Prairie, Black-and-white and Blue-winged Warblers, Yellow-breasted Chats, Scarlet Tanagers, and unusually cooperative vireos, all allowing us quality views. 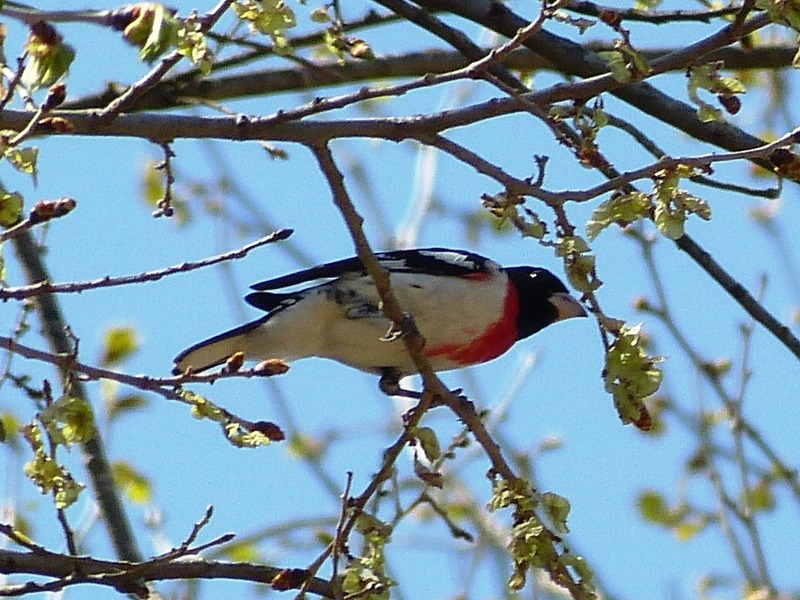 We found this gorgeous male Rose-breasted Grosbeak one afternoon and he was still working the same tree when we came back a few hours later. There were fewer wildflowers than last year when I was two weeks later. 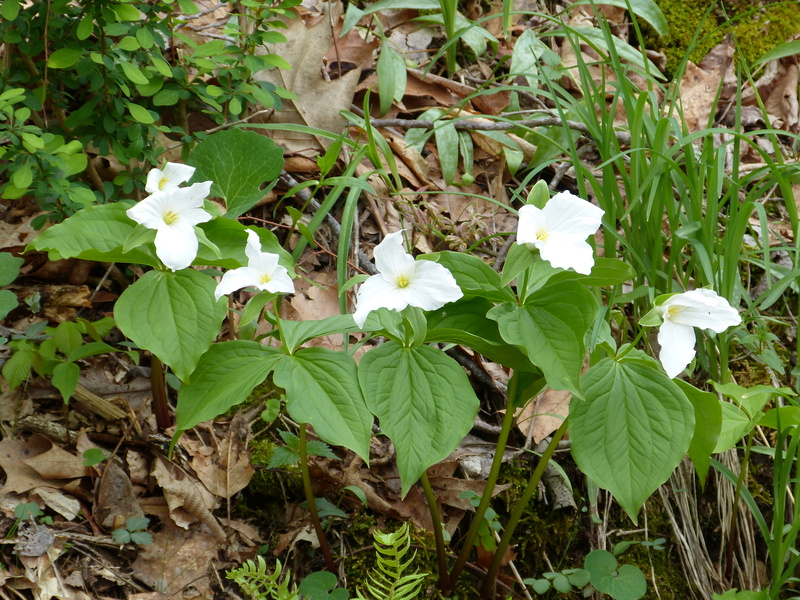 But, the forest was still lovely with Trillium grandflorum dominating the roadsides. Little patches of bluets were everywhere. Wild geraniums were beginning to pop up here and there. There were a few irises. Ferns were just starting to unfurl. On our one hot afternoon, the birds were quiet, but there was an abundance of butterflies. 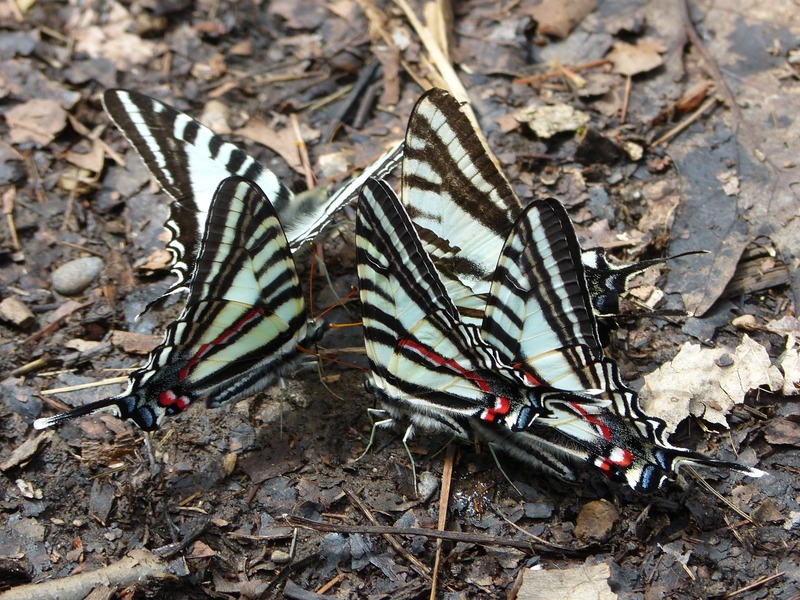 My favorites were the Zebra Swallowtails, a life butterfly for me. 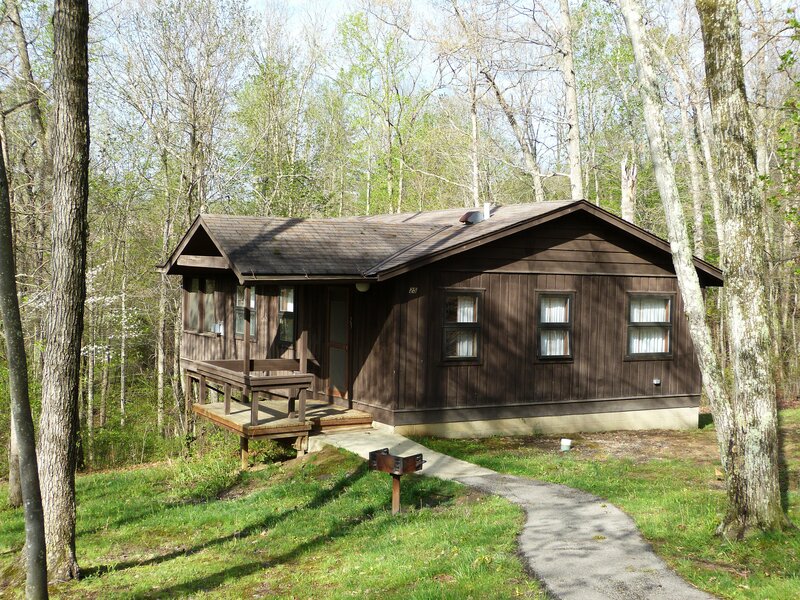 Our pet-friendly cabin in the state park was a perfect base for our stay. The state park is inside the state forest. The screened porch in the back was great for watching birds when we were tired of driving in the rain. Jack and Diane’s two dogs found the cabin as comfortable as we did. 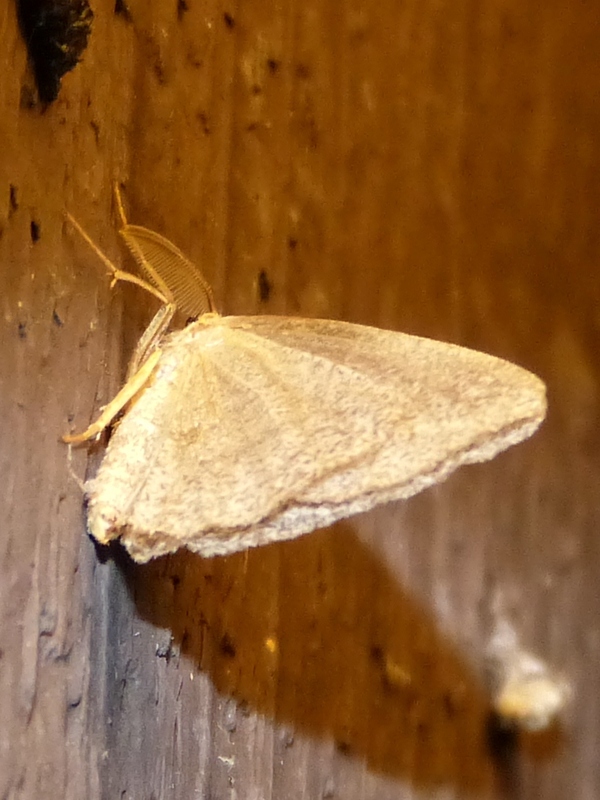 A cabin in the woods also let me find a few spring moths. 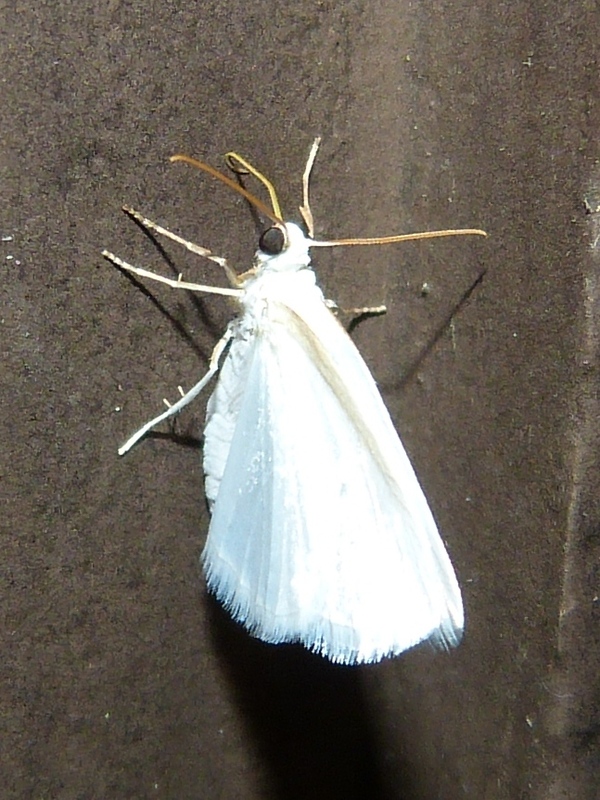 I was too tired to stay up late, but saw these pretty little moths just before bedtime. Other birders reported Cerulean Warblers in the cabin area. We did not see them, although we thought that we heard them a few times. It was our only real miss, not too bad considering the weather. We enjoyed the forest and the birds so much that we talked of going back next year. I hope that we are able to return to my new favorite spring birding location, Ohio’s Shawnee State Forest.